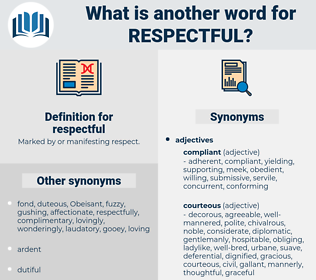 What is another word for respectful? Marked by or manifesting respect. environmentally-friendly, dignified, child-friendly, mindful, consistent, law-abiding, respectfully, sound, honourable, sustainable, gallant, lowly, decent. 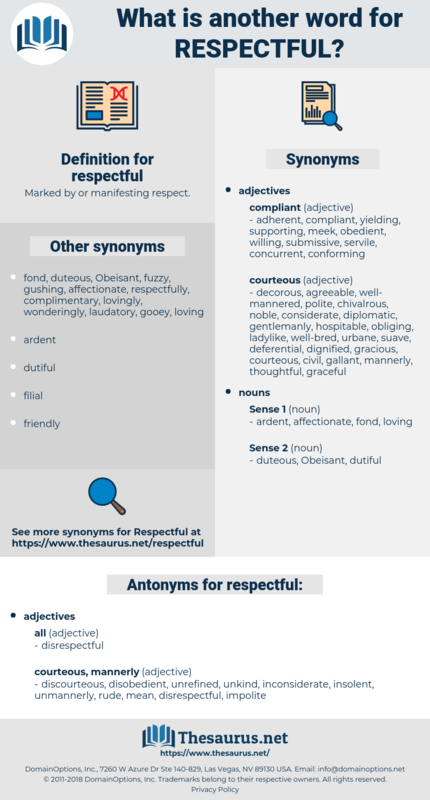 courteous, respectable, humble, sensitive, friendly, polite, compliant. impolite, unkind, insolent, discourteous, unrefined, inconsiderate, rude, unmannerly, mean, disobedient. flip, withering, jeering, gibelike, belittling, offensive, taunting.
" I'm sorry to hear it, sir," was the respectful reply. He saw the red ribbon that the commandant wore, and made a silent and respectful military salute.